LED spots with integrated accumulator pack. The accumulators are charged by means of the solar module which is included in the delivery scope. Ideal for outside use e.g. garden lights etc. The two LED spots can be individually adjusted to optimise the illumination according to the local conditions. 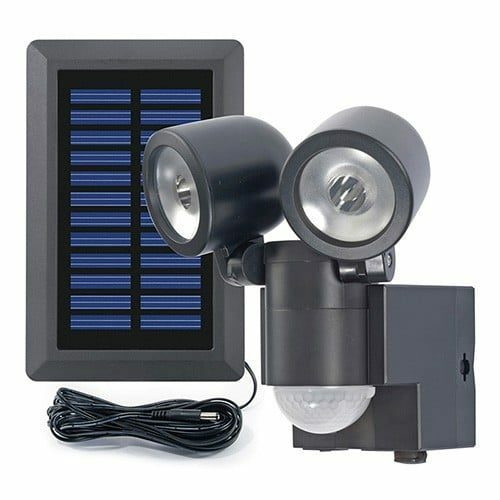 Integrated, revolvable motion sensor with long distance range. In 2001, a Greek and a guy from the Allgäu took a trip on a ship to Santorini. They decided to found a solar technology company together with a Brit, a Franconian, a Sudanese and a Rhinelander. It sounds like an absurd idea, but in the very same year, the company started its work in a garage located in the beautiful Allgäu landscape, first as a purchasing pool for international solar companies. Phaeton, a son of the Greek sun-god was the inspiration for the company name. Phaeton is a symbol for luminance, on the other hand, the story also warns against arrogance. Since the beginning, Tobias Zwirner has been Managing Director of Phaesun GmbH. Also in 2001, Phaesun Asmara was founded in Eritrea as a representative office in East Africa. In 2002, the first Phaesun product catalogue was published. In the focus were complete solar kits based on Steca electronics and packed in wooden boxes for the operation of electric tools, walkmans, diskmans and gameboys. So basically, it was 15 years ago that the cornerstone for Phaesun was laid in Memmingen, Germany. Right from the beginning, the focus has been put on the independent power supply with renewable energies. Since then, the Phaesun Team has jolted the Off-Grid community year after year again. The company has developed further in state of constant flux and agitating for a future with Off-Grid power. The BEST Products from the BEST Brands at the BEST Prices available in your market. Further discounts on bulk purchase.